With one of the most joyous times of the year upon us I have learned a valuable lesson from one of my teenage daughters. Something that each and every one of us will be seeing a lot of in our lives over the next month…hugs. “Geesh”, I said to her as I hugged her and she told me I was doing it all wrong. “I’ve been doing this for a long time and in following my intuition thought I was doing pretty good at it”. Whenever there were hellos or goodbyes there was a hug; for comfort or the need for soothing reassurance that it’s all ok there was a hug; for ending quarrel a hug was/is a real “deal sealer”; celebratory hugs, playful group hugs. Heck I even noticed there is a remote hug jacket for sending hugs long distance. Hugging is the single most under-exercised human ability. The cost is minimal, just a few minutes of your time and the ROI (Return on Investment) is huge. The effects are immediate! Hugging has therapeutic claims which include lowering blood pressure (a University of North Carolina study showed that hugs increased levels of the hormone oxytocin), reduces stress, improve overall mood and increase nerve activity. “A good hug speaks directly to your body and soul, making you feel loved and special,” says Mihalko Baczynski, a relationship coach. Even in a grown up child a hug can be most reassuring and nurturing. 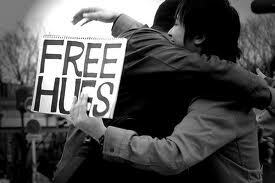 Do you remember those random hug campaigns held in public places? Do you remember how you couldn’t observe without smiling? Do you remember being drawn to the person to receive one? Now that’s powerful. If it has been more than a couple of hours since you have hugged someone, it’s been too long. It’s been said that we need four hugs a day for survival. We need eight hugs a day for maintenance. We need twelve hugs a day for growth. This IS the gift that truly keeps on giving. The lesson on how to do the very best hug is simple. Left to left. Although the heart is actually located in the center of your chest, right behind the breast bone (sternum). The left side of the heart is slightly larger and therefore the heart tilts to the left side. Have you ever noticed when your heart was just bursting with goodness? That’s when it’s beating with life and love to be shared and that’s when it’s primed for a hug. Even when it’s (your heart) feeling low or emptied, a hug will help. I will admit it takes a conscience effort the first couple of times, but when you feel the difference, “it’s a good thing”. When we hug left to left we pass along that energy inside us to better anothers day or allow ourselves to be open to receiving from another. Shelly Long said once that, if you visualize, you can actually hug on the phone? With my arms and heart open wide I am sending a huge hug to each and every one of you…….pass it on.